How do researchers keep track of scholarly research? The cloud can be a powerful tool for conducting and managing research. 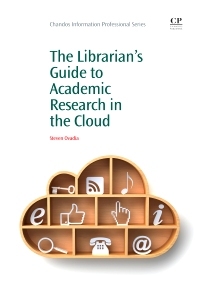 The Librarian’s Guide to Academic Research in the Cloud is a practical guide to using cloud services from a librarian’s point of view. As well as discussing how to use various cloud-based services, the title considers the various privacy and data portability issues associated with web-based services. This book helps readers make the most of cloud computing, including how to fold mobile devices into the cloud-based research management equation. The book is divided into several chapters, each considering a key aspect of academic research in the cloud, including: defining the cloud; capturing information; capturing and managing scholarly information; storing files; staying organized, communicating; and sharing. The book ends by considering the future of the cloud, examining what readers can expect from cloud services in the next few years, and how research might be changed as a result. Steven Ovadia is Associate Professor/Web Services Librarian at LaGuardia Community College, CUNY. He frequently writes about how users interact with information in an online context. He is the Internet Connection columnist for Behavioral & Social Sciences Librarian and his work has been published in Journal of Academic Librarianship, Library Philosophy and Practice, and Journal of Web Librarianship. Steven has an MLIS from Palmer School of Library and Information Science, and an MA in Applied Social Research from Queens College, CUNY.